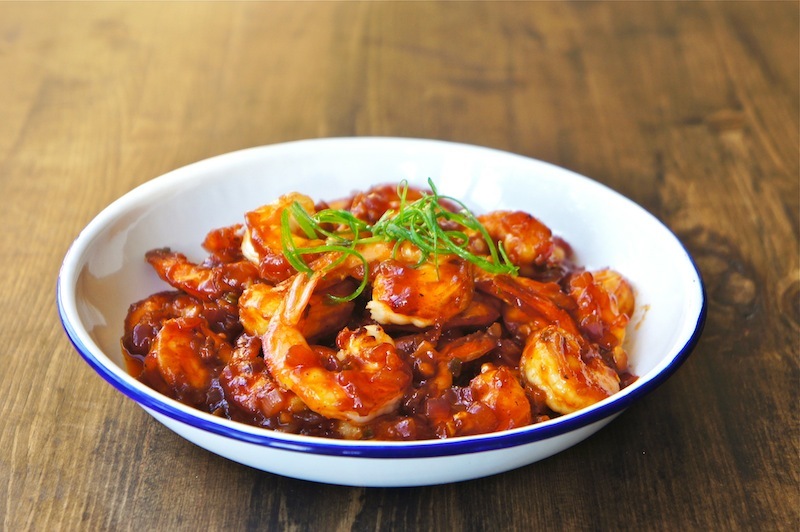 This is a sweet, tangy, and sticky Zesty Ketchup Prawns dish. Shelled prawns are preferred for this recipe. This is best served with plenty of steamed rice, and they are really finger licking good! Heat about 3 Tbsp of peanut oil in a pan over high heat. Pan-fry the prawns in batches until cooked. Remove the prawns and set aside. Leave about 1 ½ Tsp of the oil in the wok. Cook the garlic, ginger, chili, and onion over moderate heat until the mixture is fragrant and sticky. Mix in the Kicap manis, ketchup, chili flakes, sugar, black pepper, water and give it a quick stir. Add in the prawns and stir until all the prawns are coated with the sauce. Season with sea salt if necessary. Transfer the prawns to a serving plate and serve immediately. My husband will really love this dish. Thanks for sharing. By the way, any substitute for the Kicap manis? @MyFudo:You can substitute the Kicap manis with regular dark soy sauce. Do adjust the seasoning with additional sugar if desired. I made this tonight and it was so delicious! Thank you for such a wonderful and easy recipe!